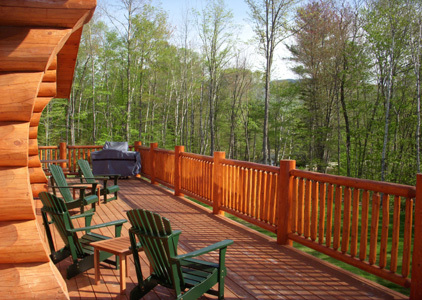 The Bear River Cabin is the most spectacular vacation rental in Western Maine. Constructed of large logs handcrafted by North American Log Crafters this large, new, western style log cabin is located on 57 dramatic and secluded acres. If you’re looking for a true Maine experience rather than a vacation rental in a subdivision you’ll fall in love with the Bear River Cabin – a million dollar Cabin on a million dollar site. “The overall size and utter beauty of this cabin is unreal. The woodworking is like nothing anyone has ever seen. The attention to detail is what makes it truly amazing ~T. G. Boston, MA, USA. Bear River Cabin’s design, layout, amenities and spectacular site sets a new standard for luxurious, year-round, country vacation rental in Maine. The cabin is sited on slopping terrain, is reached by a bridge over the river, and has panoramic views of the river and mountains forming the Bear River Valley. Built of Douglas fir logs, from 13 to 17 inches in diameter that were imported from British Colombia, the Cabin was designed and finished with over 8,000 square feet of pine ceilings and a dramatic pitched roof that includes four large gables and four dormers. A computerized radiant heating system installed beneath the floors throughout the Cabin (including the garage) insures that our guests will always be comfortable and will be able to walk around the Cabin in their stocking feet, regardless of the outside temperature. Plan Your North American Log Crafters Luxury Log Cabin for Vacations with Family and Friends! 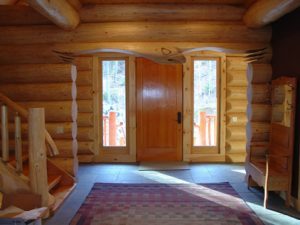 Visit www.bearrivercabin.com for interior/exterior photos and videos that showcase the impressive log quality and workmanship by North American Log Crafters. Imagine your family vacation in this incredible log home. Even better, imagine your own log cabin getaway! 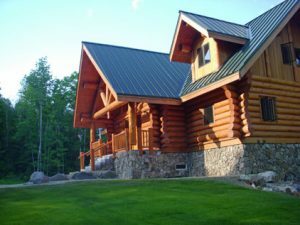 Meet trusted, friendly people at Bear River Cabin and North American Log Crafters who’ll help make your log cabin dreams come true! Read first hand reviews and enthusiastic descriptions from people who have stayed at the Bear River Cabin or check availability of this specatacular all-season vacation rental at HomeAway.